These are some unique tea presentations for gift giving or for that special "Especially For Me" moment. Enjoy the design and descriptions as much as the three teas. 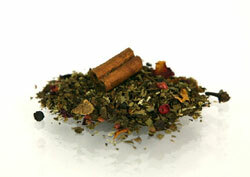 Golden Tiger Tea - Chinese and Indian black teas blended with cocoa, cardamom, cinnamon and calendula petals. Use boiling water. Let steep 4-5 min. or to your liking. 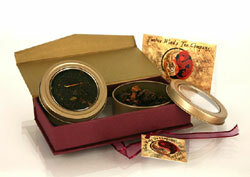 Hidden Treasures Dragon Tea - Chinese lychee black tea, dried cranberries, rosehips, hibiscus and apple bits. Use boiling water. Let steep 4 min. or up to 8 min. for a very lively, fruity taste with a deep, red glow. Using the same tea leaves, steep another cup of tea several times. Adjust steeping time accordingly. Though chai means tea, in this instance, it is a mix of spices and black teas, which when steeped are then blended with milk and sugar. This is the national beverage of India. Chai wallahs (now famous due to the award-winning Slumdog movie) are the boys adept at keeping a perfect brew all day long as they peddle their chai in the open markets and railroad stations. Includes 4 grams.